If you have seen a true 'Rainbow' Moonstone, then you know that it is a superb material. Now, this term does require some explanation as it is something of a misnomer that has stuck over the years. Mineralogically, this is not Moonstone (Orthoclase) but another Feldspar entirely - Labradorite. That much can generally be forgiven as the Feldspar family is a large and complex one, and even visually this bears more resemblance to a classic Moonstone than a Labradorite. However, when this material was first found a couple of decades back in Southern India it was indeed found to be Labradorite, albeit a rather unique variety. 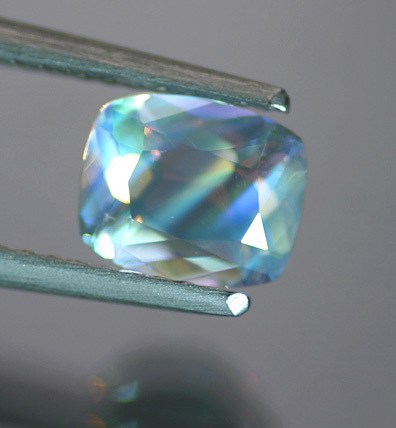 This type is something of a hybrid - it looks like a faceted Moonstone with its clarity and bodycolor, but the color flash is much more spectral than the typically billowy silver-gray and blue of Moonstone. It has the full flash of Labradorite. Unfortunately nearly every Moonstone has become a 'rainbow' one in the trade, but the name should be reserved for these truly resplendent examples. Once you see on of these and there dramatic rainbow of colors, you will not forget it. This gorgeous stone is from a limited new find in Africa - both Zambia and some similar stones from Madagascar we now know. This lovely stone is of a respectable size, perfect clarity and a particularly fine range of color - very much at the top end of the quality for this unique material.